A little jaded with football, I went on to Netflix last night to try to find a film that we could maybe enjoy together. Sam is thirteen and he likes a good Netflix movie, whenever I manage to dig one up. I was clicking through the myriad options, rejecting, rejecting, rejecting, when the screen threw up this one and I lit up with delight. 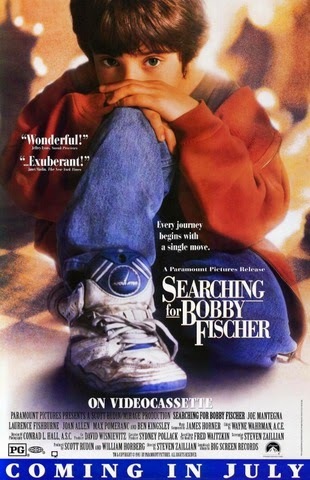 When I first saw it, back in about 1994, ‘Innocent Moves’ was called ‘Searching for Bobby Fischer’. I watched it on my own, back then, on VHS and I liked it very much indeed. But how would it stand up twenty one years later? Would it be all dated and soppy and irrelevant? My answer to that is a confident ‘no’. After watching it again last night, I would say that this little film has now elevated itself beyond my ‘Liked it Very Much’ rating of 1994 up to being one of the best films I have ever seen. I don’t want to tell you the plot or stuff like that. I just want to tell you that it’s a good film and then go away. But you want to know a little bit more, I suppose. It’s about Chess, okay? It’s about a little boy who is very good at Chess and how the people in his life struggle to make the best of that talent for him. Ultimately, as is the nature of good movies, it's not really about what it proports to be about at all. I think it's about Fathers and their Sons and how they strive to satisfy each other. It could be that I particularly like the film because I have been a very keen chess player at several periods in my life (I’m not right now). I recognise so many of the set ups – the dusty chess club halls where people meet to play, the kids tournaments where the ring of time clocks being slapped echoes around the rafters. It could because I’m a chess fan but I don’t really think so. I don’t reckon you need to even know how to play chess to enjoy this modest little film. As a writer myself, I think one of the keys to the enjoyment of this film is in the screenplay. It’s not the only thing. There is, for instance, a really good cast with Ben Kingsley, Joe Mantagna and Laurence Fishburne really standing out. The kid, too, is beautifully cast. He has a dream-ridden gaze which makes him open and endearing but he also brings a casual air of detachment, particularly when at the chess board, which is a little unnerving at times. His name is Max Pomeranc and he was really very good. The supporting cast is great, the music is good, the New York locations are lovely. There is a subtle list of real life chess heroes populating the backdrop of the action, including a cameo from Joshua Waitzkin, who is the real life chess prodigy on which the film is closely based. All of this is great but I think the writing, the screenplay, gives a small masterclass in how it can be done. It’s written by Stephen Zaillian who is no ‘patzer’ of course, he having written ‘Schindler’s List’, ‘Gangs of New York’, and many others. I can’t point to any one thing that makes this screenplay stand out. To me, it just seems so good on every level. The tics, the tiny reversals, the character arcs, the humour, the emotion (so well wrought). It’s not perfect, nothing is. One scene where the Dad rails against Josh’s mild-mannered but annoying teacher, seems to leave the female characters oddly impotent and subservient. It feels odd to me anyway. Also the final reel has an almost-obligatory ‘Rocky’ feel to it that sits a tiny bit uncomfortably with the subtle integrity of the rest of the film. These are minor gripes though. I could sit and watch this again right now and, indeed, I very well might. So, if you have Netflix and you fancy a little film that you and the kids could enjoy together, or if you see it turn up on some outer limits of the TV schedule some evening, give this one a go. I think you might like it. Let me know if you do, or even if you don’t. ... or maybe I will.